Maybe I’m getting into a rut. I’ve been traveling to the Sierra Foothills for a wine-tasting day trip on Thanksgiving weekend for long enough now that I can almost see my tire tracks from the previous year in the dirt winery roads. Regardless, it’s a most enjoyable rut to be in, and I continued the post-turkey day tradition this year with my friends Jane and Laura. It was a beautiful sunny but cool morning in the Bay Area, but we ran into thick fog as we drove through the Central Valley. Fortunately it was not the dense stuff that comes right down to the ground and makes driving hazardous, but it still was not much fun going through it. Eventually we rose above the fog layer as we headed past Sacramento and into the Sierra Foothills. We arrived in the Placerville area earlier than expected, and since the first winery we’d planned to visit didn’t open until 11am, we stopped along the town’s quaint main street for a look around. After awhile we started to get hungry, and we decided on an early lunch in town at Z Pie. Jane and Laura had been there before, so we stopped in for their “Gourmet Pot Pies.” We each ordered a different pie – they arrived at our table quickly and all were delicious. Besides being very tasty, my chicken and mushroom pie managed to strike the difficult balance of being hot while not being so hot that it burned my mouth. After finishing our lunch, we made the short drive north of Placerville and followed scenic Carson Road into the Apple Hill area. After a couple of miles along Carson Road, we came to the winery and tasting room of Grace Patriot Wines. This is a fairly new winery with a couple of long threads of history behind it. The winery building was completed in 2010 and the tasting room opened just this year. 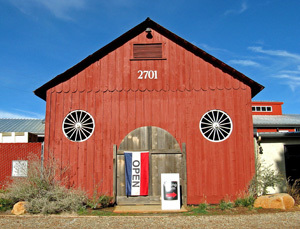 The tasting room is housed in a portion of a familiar building along the roadside – the 1885 barn of the historic Irving Ranch. Along with the old Irving house itself, the barn has been nicely restored. Irving Ranch was a thriving operation a century ago, with vineyards on the property up until Prohibition. The other thread of history is with the current owners of Irving Ranch, the Grace family, who launched their winery a few years ago. The winery name honors ancestor Lewis Grace, who served in the Continental Army during the Revolutionary War and was killed in a 1780 battle. Grace Patriot is very much a family operation. Owners Steve and Bea Grace run the business. Steve Grace is also a plastic surgeon with a practice in Reno. Their son Tyler is the winemaker – he has a degree in Enology and Viticulture from Fresno State University and has worked in Napa Valley and Australia. Another son, Trevor, assists in the winemaking and manages the tasting room. Grace Patriot 2009 Pinot Gris, Estate, El Dorado. Light straw color with a faint greenish tinge, this showed ripe stone fruit and tropical fruit aromas along with a touch of vanilla/oak. Medium-light bodied with a smooth finish. Grace Patriot 2009 Pinot Noir, Estate, El Dorado. Light garnet color, with bright red fruits and some smoky oak notes on the nose. Fairly light on the palate and a bit thin on the finish, but a pleasant wine and one of the better Sierra Foothills Pinots I’ve tasted. Grace Patriot 2006 Syrah, Renner Vineyard, Sierra Foothills. Medium purple, displaying plum and darker berry fruit, earth, black pepper, and baking spices. Nice depth and mouthfeel, this finished with moderate tannins. Grace Patriot 2005 Tempranillo, El Dorado. Medium-dark color, this featured plum and blueberry, smoke, leather, and a dash of well-integrated sweet oak. Lively acidity and good structure for a few more years of bottle age. Quite a nice California Tempranillo. Grace Patriot 2005 Cabernet Sauvignon, El Dorado. Medium-dark color, with dark fruit, green olive, and cedar notes, this was a medium-bodied Cab with a moderately grippy finish. Grace Patriot 2006 “Aboriginal Red,” Sierra Foothills. 50% Cabernet Sauvignon, 50% Shiraz. Aiming at an Aussie-style blend, this showed bigger, more intense upfront fruit and a bigger helping of vanilla/oak. Richer and weightier on the palate than the other reds, with a long finish. Grace Patriot NV “Season Finale,” California. Port-style wine, made from ⅔ Cabernet Sauvignon with the remaining ⅓ being Souzão, Touriga Nacional, and Tinta Roriz. Medium color, showing dark berry fruit along with cocoa and brown sugar. Fairly sweet and viscous, this was a not really a standout but nevertheless was a pleasant finish to our tasting. The Grace family purchased Irving Ranch in 2000 and planted new vines in the following years. The first new fruit to be harvested from the estate vineyard was Cabernet Sauvignon in 2004. Among the grape varieties grown at the estate vineyard are Pinot Gris, Pinot Noir, Zinfandel, Primativo, Cabernet Sauvignon, Tempranillo, and Graciano. This is supplemented with Viognier, Roussanne, and Syrah, which the Graces buy from other Sierra Foothill growers. In all, 16 acres are currently planted on the 50-acre property, at an elevation of about 2,800 feet. Apples and peaches are also grown on the Graces’ Irving Ranch property. From the patio outside of the tasting room, we had a beautiful view of the rugged Crystal Range, just west of Lake Tahoe. Stepping inside, we were greeted by Bea Grace, who proceeded to pour us a selection of current releases while telling us about the winery and vineyard. Trevor Grace was also behind the long bar attending to other tasters, while Steve popped in to the tasting room for a moment as well. Bea told us that although the Grace family planted most of the vines on their property in recent years, the Pinot Gris and Pinot Noir were planted by the previous owners about 20 years ago. You don’t see much Pinot Noir grown in the warmer Sierra Foothills, but Bea said that it had been planted in a particularly cool spot in their vineyard. And the Pinot Gris was of particular interest to me since some friends and I bought a half-ton of fruit from the Grace family this year, and we’ve now got some skin-fermented Pinot Gris wine in a barrel. One of the non-estate wines we tasted, the Syrah, was sourced from Renner Vineyard in Calaveras County. The “Season Finale” is a Port-style wine made with Cabernet and three traditional Portuguese grape varieties. A future “Season Finale” release will be a 100% Cabernet Port-style wine. Besides the wines we tasted, Grace Patriot also makes Viognier, Roussanne, Rosé, and a Tempranillo-based blend called “5PM,” which also includes Cabernet, Syrah, and Petit Verdot. In addition, new Graciano and Cabernet Franc bottlings should be released soon. Bea told us that the 2010 Pinot Gris – which we did not taste on our visit – is off-dry (unlike the 2009 bottling we tried), as a small amount of botrytis-affected fruit was included in the 2010 wine. Wines are made in very limited amounts, with most bottlings 200 cases or less. The total annual production is currently around 1,200 cases. Grace Patriot looks like a promising newcomer to the El Dorado wine scene. A few of their wines – their Cabernet and Tempranillo in particular – have done well at several prestigious wine competitions, and with prices ranging from $15-30, they offer good value. I’d say that Grace Patriot’s stated aim of making bold wines with elegance seems to be an apt description of their style. My favorites were the Syrah and the Tempranillo. The wines were solid across the board, and if most do not especially stand out yet, with more time fine-tuning the vineyard practices and the winemaking, I think we’ll see more noteworthy wines from Grace Patriot in the years to come. We didn’t have many definite winery visit ideas for the day, but we thought we would drive south from Apple Hill to the Pleasant Valley area. Home to several fine wineries including Sierra Vista and Holly’s Hill, we decided to stop at Miraflores this time. We’d visited Miraflores once before, in the fall of 2008. A new tasting room building has been constructed since our earlier visit – it’s been open since November 2010. The handsome Mediterranean-style building features a stone floor and huge recycled Douglas Fir roof beams, which were originally part of the old Oakland Ferry Building, demolished in the 1930s. Miraflores 2010 Chardonnay, Sierra Foothills. Light yellow color, with tropical fruit and vanilla/oak on the nose. Moderately creamy texture in the mouth, with a smooth finish. Miraflores 2010 Pinot Grigio, Sierra Foothills. Light straw color, displaying pear and spice aromas. More crisp than the Grace Patriot Pinot Gris, this one had a touch of harshness on the finish that will probably round out with a bit more time in the bottle. Miraflores 2006 Barbera, Sierra Foothills. Medium reddish purple, this showed fairly tart black cherry fruit along with touches of spice and oak. Medium-light weight on the palate, with good acidity and mild tannins. Miraflores 2006 Zinfandel, El Dorado. From estate fruit, this had intense aromas of ripe raspberry and boysenberry, pepper, and lots of spice. For a five year-old Zin, the mouthfeel was still quite lively and the tannins still grippy and youthful. Nice wine that should continue to develop with more cellar age. Miraflores 2007 Zinfandel, El Dorado. Medium color, this was not as aromatic as the ’06 vintage, showing slightly less ripe fruit, a bigger pepper component, and more noticeable oak. Big and structured, with somewhat rough tannins on the finish. Miraflores 2005 Syrah, El Dorado. Medium-dark color, showing plum and darker berry fruit, herbs, and baking spices. Fairly rich mouthfeel with moderate tannins. Miraflores 2006 Syrah, El Dorado. Medium-dark purple, this was less fruit-forward on the nose than the ’05, showing lots of pepper, earth, and a good deal of sweet oak along with the dark fruit. Bigger on the palate with a very chewy tannic finish, this still needs some time to settle down. Miraflores 2006 Petite Sirah, El Dorado. Dark color, featuring blueberry and blackberry fruit, black pepper, anise and other spices, and meaty/gamey aromas. Big and mouthfilling but with surprisingly tame tannins, very nice. Miraflores NV “Príncipe,” California. A Port-style wine made from Tinta Cão and Touriga Nacional grown in El Dorado and Amador Counties. Dark color, very aromatic with floral and dark chocolate notes in the foreground, plus plummy fruit. Medium-sweet and very viscous on the palate. Miraflores 2008 Muscat Canelli, El Dorado. Very light color, with perfumey, floral aromas along with peach and apricot fruit – a fruit juice character to it. Moderately rich and not overly sweet, this was a pleasant if not especially complex wine. Miraflores 2008 “Botricelli,” California. From Semillon and Sauvignon Blanc grown in Lake County. Medium yellow color, this had a slight matchstick note along with honey, apricots, and a touch of earth. Very thick and rich, and moderately sweet with good balancing acidity. It was quite tasty and has the potential to age well. Miraflores is owned by Victor and Cheryl Alvarez. They had originally looked for property on which to plant a vineyard in Arizona, where Victor is a practicing pathologist. Ultimately they purchased the 254-acre site a few miles east of Pleasant Valley in 1995. Most of the new vines were planted in 2000-01. 40 acres are currently planted, with some room for further expansion in the future. Syrah is the largest planting with 18 acres, and the vineyard also has Zinfandel, Petite Sirah, Viognier, Muscat Canelli, Cabernet Sauvignon, Mourvèdre, Tempranillo, Cabernet Franc, and Petit Verdot. The estate vineyard ranges from about 2,500 feet to nearly 3,000 feet in elevation, and various elevations and exposures were selected for the different grape varieties. Overseeing the vineyard is Rick Wickham, who grew up only a few miles from the winery and is among the most respected vineyard managers in El Dorado County. Winemaker Marco Capelli has been part of the Miraflores team since their inaugural vintage in 2003. Before that, he spent 17 years at Swanson Vineyards in Napa Valley. The winery building, just down the hill from the tasting room, was completed in 2007, and was built large enough to accommodate custom crush clients as well Miraflores’ own production. The plan is to top out their annual production at about 10,000 cases. A variety of winemaking techniques are employed on different wines – for example, the “Méthode Ancienne” Syrah bottling (which we did not taste on this visit) is foot-stomped and fermented with whole clusters and with native yeast. Wines are aged in both French and American oak. 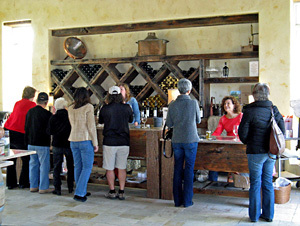 The tasting room was fairly busy when we arrived, but we had no problem staking out space at the generously-sized bar. We tasted nearly a dozen wines, ranging from the 2005 to 2010 vintages. In addition to the wines we tasted, Miraflores also produces a Mourvèdre, Tempranillo, and a Black Muscat dessert wine. Dessert wines are a something of a specialty here, and they are among the best examples I’ve tasted from the Sierra Foothills. The “Botricelli” dessert wine (clever name!) was served with a small helping of blue cheese. I happened to taste the Black Muscat at a friend’s house about a week after my winery visit, and it was exceptional. Big, bold reds are the other strong suit for Miraflores, and their Zinfandel, Syrah and Petite Sirah are noteworthy. With most of the wines in the $15-25 range, they offer very good QPR as well. My impressions of the overall Miraflores line-up on this visit was similar to how I felt when I stopped there three years earlier – that the wines were very well-made and generally good but only a few were particular standouts. There were certainly some highlights, including the fine 2006 Zinfandel and 2006 Petite Sirah, and the dessert wines are well worth seeking out. I believe that the best is yet to come from Miraflores, and it will continue to be a good choice for a winery visit in the area. From Miraflores, we drove south again along Mount Aukum Road before turning onto Fair Play Road and heading into the Fair Play AVA. Laura suggested stopping at MV Winery – she had visited there before but it was a new stop for both Jane and me. Although the winery is not listed on some of the local wine route maps, it was easy to find, right along Fair Play Road. MV 2010 Sauvignon Blanc, Lewis Vineyard, Fair Play. Very light greenish straw color, showing straightforward apple and grapefruit aromas. Medium-light weight with a smooth mouthfeel and finish. MV 2007 Zinfandel, Fair Play. Medium color, this had attractive bright berry fruit, a good helping of American oak, and a citrus/orangepeel note. Lively and not particularly tannic. A somewhat unusual but quite interesting expression of El Dorado Zin. MV 2008 Zinfandel, Fair Play. Medium color, this had a darker fruit profile than the ’07, along with a dash of mocha, spice, and American oak. Bigger on the palate with a grippier finish. MV 2008 Syrah, Baby Rattlesnake Vineyard, Fair Play. Dark color, featuring blackberry, black pepper, earth, and a savory note. Fairly rich but with bright acidity, the youthful tannins suggest that additional bottle age will be of benefit although it already displayed a long and tasty finish – very nice. MV 2007 Petite Sirah, Camden Vineyard, Fair Play. Dark color, with earthy dark berry fruit, spice, and mocha on the nose. Big but not as rich as the Syrah in the mouth, and with moderate tannins. MV 2008 Petite Sirah, Lone Meadow Vineyard, Fair Play. Very dark color, this showed riper and more aromatic fruit than the ’07 Camden bottling, with upfront plum and darker berries, vanilla/oak, and spice. Brighter mouthfeel than the ’07, with big, chewy tannins on the finish. MV 2008 Malbec, Dorado Canyon Vineyard, Fair Play. Medium-dark color, displaying black cherry, lots of baking spice, earth, and oak. Fairly full-bodied, with grippy young tannins that will take time to smooth out. MV 2008 Late Harvest Muscat Canelli, Goedeck/Liu Vineyard, Fair Play. Medium-light color, this had intense perfumey/floral Muscat aromas along with stone fruit. Rich and viscous, with fairly good acidity to balance the sweetness, and a long, smooth finish. We headed up the short drive from the road and parked in front of the small tasting room. Cindy Miller was behind the tasting bar working on wine club shipments when we arrived. Her husband John joined us a short time later. 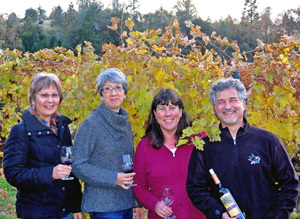 John and Cindy started out as home winemakers before launching their own winery. John had also been a vocational psychologist – he may find he needs one now that he’s gone into the wine business! The Millers purchased their property in 2004 and planted the vineyard the following year. In all, around 11 acres are planted in the decomposed granite soil that characterizes the area. They grow Zinfandel, Pinotage, Syrah, Petite Sirah, Cabernet Sauvignon, and Lagrein in their estate vineyard, and buy additional fruit from neighboring growers in the Fair Play area. Some of their purchased fruit comes from vineyards that had been sources for the old Firefall Vineyards – Lone Meadow and Baby Rattlesnake. John told us that his estate vineyard is generally farmed for yields in the 2½-3 ton per acre range. Wines are all made in small lots – no surprise when the total production ranges from only 600-1,000 cases. Most reds see around 40% new oak and spend about two years in barrel. The Millers use some American oak on the Zinfandel, which was apparent in tasting them. John told us that he likes to make full-bodied wines, and this was certainly reflected in the wines we tasted. An exception was a nice rendition of late-harvest Muscat Canelli, made entirely in stainless steel. Along with the wines we tried on our visit, MV also produces a Nebbiolo and a Port-style wine. Most wines range from $17 to $40 in price. The MV wines were somewhat hit-and-miss but they were well-made, fairly bold, and displayed some intriguing character. That seems to reflect the character of John Miller himself, who was certainly not shy about touting his opinions of the wines. But the MV 2008 Baby Rattlesnake Syrah was a real standout and the 2008 Lone Meadow Petite Sirah was also very good. I suspect that MV will continue to produce some idiosyncratic wines that won’t be for everyone, but we had a fun visit there and it’s a stop I’ll have to make again. After leaving MV, we continued east along Fair Play Road, past the small town of Fair Play itself, until we came to Skinner Vineyards. I’d had a recommendation to visit Skinner, and some of their wines have been generating some notice recently, so it looked like a good option for us. We drove past the large winery building and up a drive to the tasting room parking area. This is a brand-new facility, with the winery completed in 2010 and the tasting room just opened in spring 2011.The beautiful tasting room sits atop a knoll at an elevation of 2,700 feet, and boasts a 360-degree panorama overlooking the Fair Play area and far beyond. This is certainly one of the most spectacular vistas I’ve seen from a winery tasting room. Skinner 2009 Viognier, Stoney Creek Vineyard, Fair Play. Light straw color, featuring ripe tropical fruit and spice aromas, though no floral note as I might have expected. Medium-rich mouthfeel with a long, smooth finish. Skinner 2008 “Seven Generations,” El Dorado. 46% Roussanne, 29% Marsanne, 25% Viognier. Light color though slightly darker than the Viognier, this showed minerally stone fruit, pear, and touches of honey and spice. A bit weightier on the palate than the Viognier and fairly lively, this could develop quite nicely with some bottle age. Skinner 2008 “Eighteen Sixty-One,” El Dorado. 40% Grenache, 35% Mourvèdre, 25% Syrah. Medium-light ruby color, with black cherry and plum fruit, earth, baking spices, and smoky oak on the nose. Lighter-bodied with a juicy quality in the mouth, the smoky note reappeared on the finish. Skinner 2007 Syrah, El Dorado. Medium-dark color, displaying riper plum and dark berry fruit than the “Eighteen Sixty-One,” along with an overlay of vanilla/oak. Medium weight on the palate, with moderately grippy tannins on the finish. Skinner 2007 Syrah, Stoney Creek Vineyard, Fair Play. Co-fermented with 3% Viognier. Medium-dark purple, with brighter, “lifted” aromatics compared with the El Dorado Syrah, but no obvious floral Viognier character. Nice acidity with a touch of minerality in the mouth, not as rich as the El Dorado bottling but with a longer, livelier finish. The Skinner story starts with James Skinner, who made his way to California from his native Scotland during the Gold Rush. With gold fever waning in the area by 1860, he planted vines and soon started producing wine and brandy. Prohibition spelled the end of the original J. Skinner Winery, but Carey and Mike Skinner – the great-great-great grandson of James – re-established the family wine business in 2007. Mike heads up an insurance business in Los Angeles, while Carey is an executive in a real estate firm. Son Ryan is the winery’s General Manager, while sons Kevin and Brendan are also involved in the winery. The winery specializes in wines made from Rhône grape varieties, which are increasingly becoming a major factor in El Dorado County wine production. The original nineteenth-century Skinner vineyard was in the vicinity of Rescue, near the town of Coloma (where gold was first discovered in 1848), and parts of the old winery building remain in Cameron Park, between Placerville and Sacramento. The current Skinner vineyards are located on two sites – one of them, the Stoney Creek Vineyard, is adjacent to the winery and tasting room, while the other, the White Oak Flats Vineyard, is near the original Skinner vineyard site in Rescue. At about 1,300-foot elevation, the 13-acre White Oak Flats Vineyard is planted to Viognier, Roussanne, Marsanne, Syrah, Grenache, Mourvèdre, Carignane, and Petite Sirah, Zinfandel, and Mission – it’s been reported that this last variety is destined for an angelica-style dessert wine. Stoney Creek Vineyard ranges from 2,300 to over 2,700 feet in elevation, and varieties grown there include Viognier, Roussanne, Marsanne, Grenache Blanc, Picpoul Blanc, Syrah, Grenache, Mourvèdre, Counoise, and Petite Sirah. Currently about 20 acres are planted at the 70-acre Fair Play property. Bryan Rahn is the vineyard manager. The winemaker for Skinner is Chris Pittenger. A graduate of Cal Poly San Luis Obispo, he has an impressive résumé, having worked at wineries including Robert Biale in Napa Valley, Kim Crawford in New Zealand, Torbreck in Australia, and Williams-Selyem and Marcassin in Sonoma. The first releases from Skinner were from 2007 vintage – the earlier wines were produced at a custom crush facility. Designed to be environmentally friendly, the new 12,000 square-foot winery building used 80% recycled steel and has a photo-voltaic panel system on the roof to provide most of the facility’s power. The design of the winery exterior – right down to the “Skinner Native Wine & Brandy” sign on the front – is based on photos of the original J. Skinner winery building. The new building can accommodate plenty of expansion from the current annual production of around 2,000 cases. Production will grow as estate vineyard production increases, with a maximum of 10,000 cases. The wines are made from both estate vineyard fruit and purchased fruit – about 75% of the current production comes from estate fruit. Outside sources include several noted vineyards including Fenaughty and Sumu Kaw. Skinner’s Viognier is fermented and aged in both new and older barrels as well as in stainless steel. The Rosé (which we did not taste on this visit) is mostly Grenache with a little Mourvèdre. The “Eighteen Sixty-One” red blend honors the year of the initial Skinner family planting of grapevines in the Sierra Foothills. Fruit for the current “Eighteen Sixty-One” release was sourced from five El Dorado vineyards with elevations above 2,700 feet. We headed into the Skinner tasting room and found a spot along the tasting bar. Our pourer that day was Jeff, who gave us tastes of five current wines. Skinner makes several other wines that were not being poured the afternoon we visited, including their Grenache Blanc, recently named one of this year’s top 100 West Coast Wines by the San Francisco Chronicle. A couple of other wines – the Rosé and Grenache – were already sold out. Like all the wineries we visited on this day, prices are very reasonable, with currently-available wines ranging from $18-34. Skinner has obviously put a lot of resources into their new vineyards and winery, and they are quickly making a splash in the often-quiet El Dorado wine scene. The wines we tasted were all good, and a couple of them were standouts. I thought the 2008 “Seven Generations” white Rhône-style blend was the highlight of the wines we tasted, and the 2007 Stoney Creek Syrah was not far behind. It would have been nice to try the Grenache Blanc, but that just creates one more of many reasons to return here. Skinner is off to a promising start and is a winery to watch in the coming years. Cedarville 2010 Viognier, El Dorado. 100% Viognier. Light straw color, the 2010 vintage showed more intense and ripe upfront fruit than some vintages of this wine. Aromas included stone fruit, citrus, and spice, along with a minerally note. Fairly big and rich, this had a long smooth finish. Cedarville 2009 Grenache, El Dorado. Includes 16% Syrah, 8% of which was co-fermented with the Grenache. Light ruby color, featuring strawberry, cherry, earth, and touches of vanilla/oak and minerals. Medium-bodied with a juicy mouthfeel and finish, nice. Cedarville 2009 Zinfandel, El Dorado. Blended with about 8% Petite Sirah. Medium-dark color, this displayed ripe, brambly wild berry and darker fruits on the nose, plus spice, sweet oak, and a dash of pepper. Big and intense in the mouth, with tannins that will need some time to smooth out. Cedarville 2009 Syrah, El Dorado. Includes 4% co-fermented Viognier. Dark color, this featured complex aromas of plum and darker berry fruit, pepper, dried herbs, minerals, plus a grilled meat component. Bright yet rich on the palate, beautifully-balanced and with fine tannins on the finish. Certainly tasty now but should develop well with time in the cellar, very nice. Cedarville 2009 Petite Sirah, El Dorado. Blended with 5% Cabernet Sauvignon. Dark color, with ripe dark berry fruit, black pepper, earth, and vanilla/oak on the nose. Very big and rich, but with surprisingly moderate tannins. Cabernet. Dark purple color, showing ripe black cherry, plum, herb/tobacco, and mocha aromas. Fairly big but lively mouthfeel, with a firm tannic finish. We drove back along Fair Play Road after leaving Skinner, and then turned up the dirt drive that leads to Single Leaf Vineyards and then to Cedarville Vineyard beyond. We noticed several rows of vines with dark fruit still hanging at Single Leaf and wondered why – maybe getting ready to make some late harvest wine? We never did find out. After pulling into the parking area at Cedarville, Jonathan Lachs greeted us as we walked from the car to the winery building. He suggested we sit outside under their crushpad overhang since it was such a beautiful late afternoon. Susan Marks arrived shortly afterwards, and joined us on the crushpad. 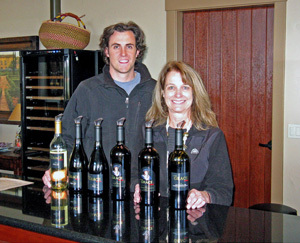 Jonathan and Susan are the owners/winemakers of Cedarville, and I’ve visited their Fair Play winery on many occasions. Since I’ve written about their vineyard and winemaking before, I’ll just provide a brief overview here. 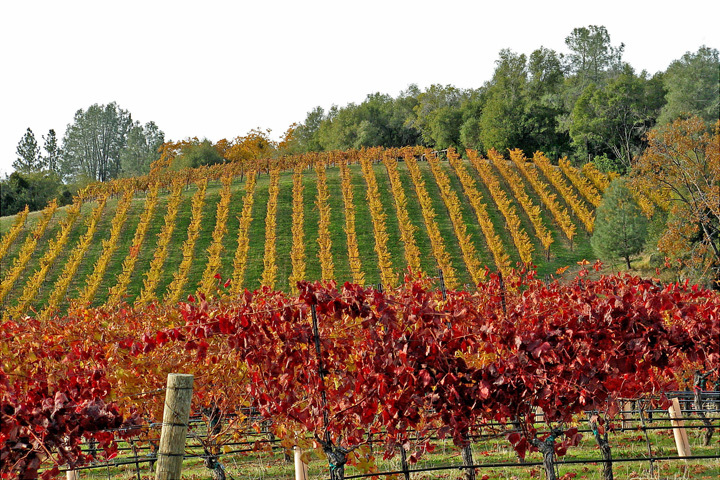 Cedarville’s main focus is on Rhône varieties, plus Zinfandel and Cabernet. Jonathan and Susan met while studying Enology at UC Davis. After graduating, they both worked for several wineries in Napa Valley and the Central Coast. They also spent 15 years working in Silicon Valley, and they remain big San Jose Sharks hockey fans (which I am as well!). Eventually they decided to take the plunge into starting their own winery, and they chose the Sierra Foothills as a location. 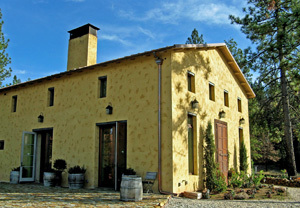 They bought their property in the mid-1990s, planted a vineyard, and produced their first wines from the 1998 vintage. Jonathan and Susan moved to the property full-time in 1999, and in the following year they completed their winery building. 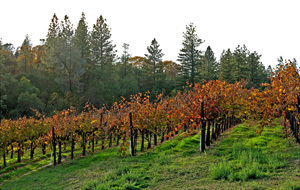 The 15-acre estate vineyard, on decomposed granite soil at an elevation of about 2,500 feet, includes Viognier, Grenache, Mourvèdre, Syrah, Zinfandel, and Cabernet Sauvignon. They use most of this fruit for their own wines but sell some of it to other wineries. 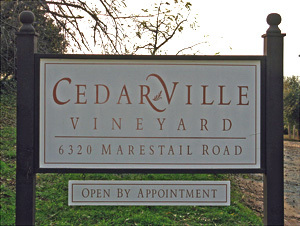 All of Cedarville’s wines are made from their estate-grown fruit except for their Petite Sirah, which is sourced from nearby Naylor Vineyard. The winery building is dug into a hillside next to the vineyard, where it remains naturally cool during the hot summer months. Wines are fermented in small lots, and favorite coopers include François Frères, Seguin Moreau, and Meyrieux. The annual production is around 2,500 cases and wines are in the $20-30 range. The biggest change at Cedarville over the past couple of years is that since the 2010 growing season, they are farming their vineyard organically. Since Jonathan and Susan had always taken the approach of sustainable farming, it was not a huge step for them but still took a commitment to move to organic growing. Tilling and mowing to control weed growth, using natural products to control mold and mildew, growing a cover crop to help fix nitrogen in the soil and provide habitat for beneficial insects, and installing owl boxes are all part of the current organic regimen. The first wine from Cedarville’s organically-grown fruit is their new release of 2010 Viognier. As we tasted through the current Cedarville releases with Jonathan and Susan, we talked a bit about the difficult 2011 growing season. The unusually cool spring and summer led to concern all over the state that some fruit might not ripen in the fall, and the Sierra Foothills was no exception. Harvest was quite late this year, and Jonathan had told me that he’d had serious concerns whether some of their fruit would make it. Although in the end Cedarville managed to get a good crop, unfortunately there will not be a Petite Sirah from Naylor Vineyard from 2011. 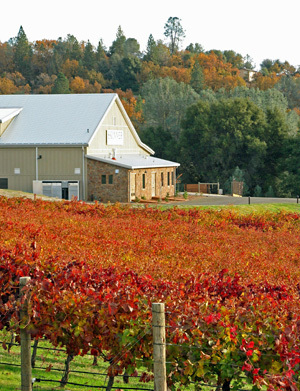 Cedarville’s wines remain among the very best produced in the Sierra Foothills. It seems that each year, it’s a different one of their wines that impresses me the most, and this time it was their 2009 Syrah that was the standout. Their 2009 Grenache and 2010 Viognier were not far off the pace, and all three of these wines showcase the minerality that this vineyard seems to express so well. And in California, there are few wineries that offer better value for the quality up and down their line-up than Cedarville. Visiting with Jonathan and Susan at Cedarville is always a highlight of my annual post-Thanksgiving wine trip to the Sierra Foothills. It was getting dark by the time we left Cedarville. We discovered that the gate of Single Leaf Vineyards had already been closed for the day, so we had to get out of the car to open it up and then close it again once we’d gone through. We drove along curving mountain roads before reaching the outskirts of Placerville, where we continued west along the freeway to Cameron Park. We had dinner there at Zac Jack Bistro, a sister restaurant of Zachary Jacques in Placerville, where I’ve enjoyed several fine meals. Jane, Laura, and I shared a warm spinach salad, bacon and prosciutto pizza, and salmon BLT sandwich – nothing too fancy but it hit the spot. Having dinner along the way home made the drive back to the Bay Area a quick one, though the thick fog remained in the Central Valley and all the way to Walnut Creek on our return trip. Despite the long drive from the Bay Area, visiting El Dorado wine country is always an enjoyable time, especially when the weather is as pleasant as it was this year. It’s refreshing to visit a California wine region where many – probably most – tasting rooms do not charge a tasting fee and where most wines are $30 or less. It was fun to visit some new wineries in the area this year, and the quality of wine from relative newcomers Grace Patriot and Skinner is an good sign that this is a wine region on the rise. And while Cedarville continues to set the bar in the area, Miraflores is producing solid wines, and the more quirky wines from MV Winery will surely find their fans as well. As always, thanks to everyone that we visited for being so generous with their time and their wine!